For those who appreciate a little extra plastic under your feet, this ticks all the boxes. Featuring our secret plastic formula, this Penny Nickel 27" is matched with Custom 4" green and yellow Penny trucks, red 59mm 78A super smooth Penny wheels, and Penny Abec7 bearings. Please note, Nickel owners have reported drastic increases in summery vibrations. Featuring a great geometric print and a solid blue deck, the Carlton 27 would feel right at home in the decade of double denim and hip-hop. Cruise the streets on this retro-inspired board and boost your street cred with a nod to the 90s. 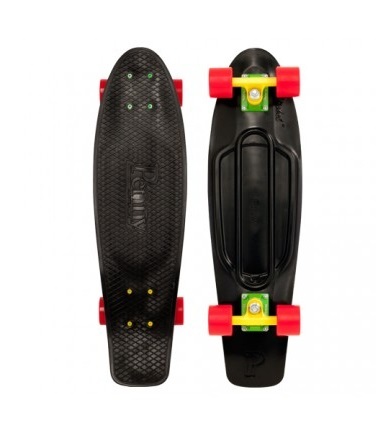 The Penny 22 Rasta is a tribute to the Rasta legends of the past and present. They believed in love, peace and equality a message thats not far from Pennys ideals. We totally agree with Bob Marley when he said, "In this bright future, you cant forget your past. Were proud of the heritage of our boards. Penny skateboards are inspired by the original plastic skateboards of the sixties, boards that gained popularity around same time Marley did. They're short and swift, ready to pick up speed and weave along sidewalks. 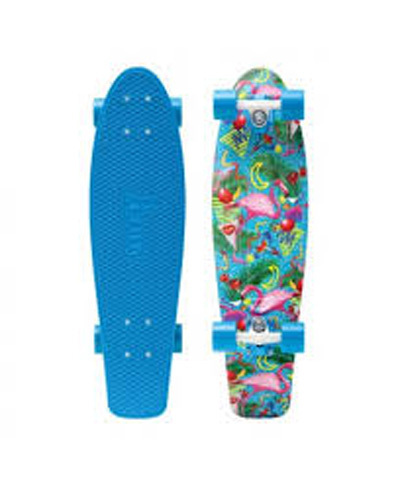 With a vibrant print on one side and a cobalt blue deck on the other, the Miami 27" is one of the most eye-catching designs in the Penny collection. It was inspired by the bright and colourful city of Miami, with traces of 90s street style think flamingos, palm trees and bright colours. Featured as a part of the Fresh Prints range, this board demands attention. With a strong geometric print on one side, and a sweet glow deck on the other, the Slater 27 is a sweet addition to your Penny collection. Inspired by the amazingness that was the 90s think hip-hop, iconic television, and great street style, this board is seriously cool and features as part of the Fresh Prints range. 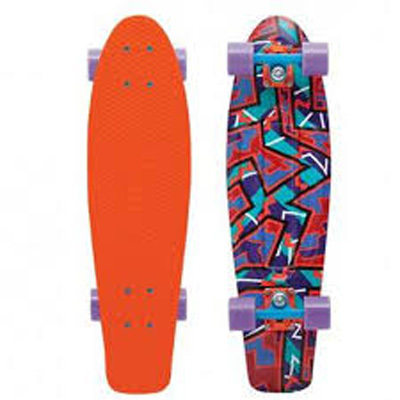 With a graffiti-inspired geometric print and an orange burst of colour that brings instant fun, the Spike 27 is a great skateboard for any Penny fan. 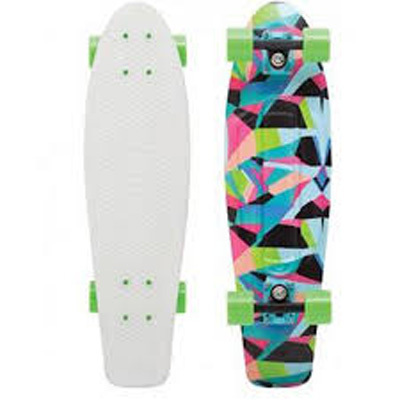 In a nod to the 90s goodness thats re-invigorating our current style, this board will give you instant street cred. All components of the Penny 22" Pendleton Pink skateboard have been selected carefully to reflect the shades used in Don Pendleton's exclusive artwork for Penny. 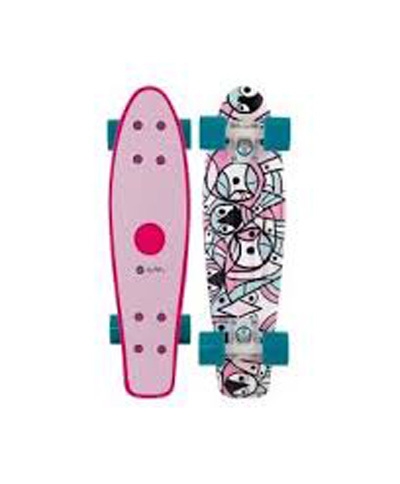 A hot pink deck with matching pale pink grip tape on top is enhanced by white trucks and contrasting teal wheels and bolts. Show off your individuality with the Penny 22" Pendleton Pink. With his passion for skateboarding and unique approach to art, colour and shape, Don Pendleton is an American artist, who has brought life and colour to skateboarding for many years. His cubist creations further enhance the original penny skateboard, by incorporating artistic color formations and combinations. 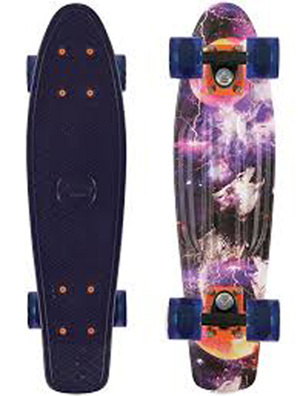 the Penny space board combines out-of-this-world mystical visuals and astrological themes, faded into a howling wolf graphic feature that speaks of ancient tribal mythology. We have wrapped this stellar graphic around Penny's super strong 22" deck. Its fitting to have such a cosmic-themed graphic on a Penny board as we drew our inspiration for these decks from the sleek board designs of the 60s, a time when the space race and interstellar travel was all the rage. We doubt any of the Apollo spacecraft looked this good though. Embrace the relaxed, carefree lifestyle and show off your inner hippy with this expressive Woodstock 22" graphic penny skateboard. 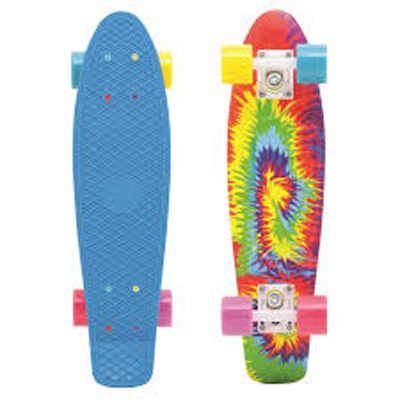 You'll enjoy many chilled out adventures on this great board, which features a tie-dye print in rainbow colors. A crowd favorite, the Woodstock graphic Penny is a great ride for anyone who wants to let their wild side roam free. 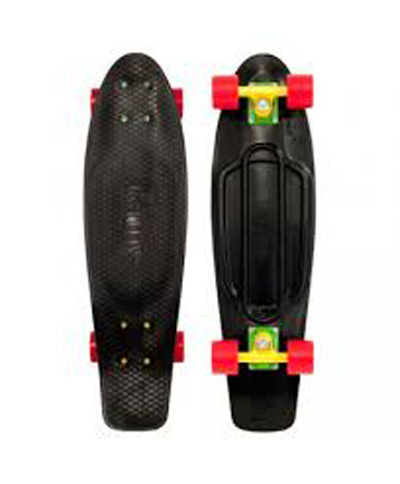 The 22" board size is great for a quick and easy skate to wherever you're going, and is easily transported when you're off the street. 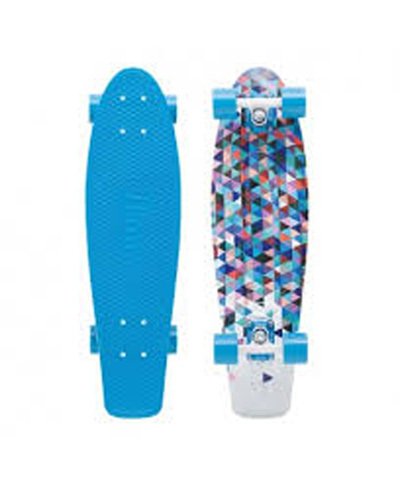 With rainbow tie-dye coloring's on one side of your deck, and our classic blue waffled top on the other, this board is sure to grab attention. Four 59mm 83A wheels Woodstock Penny and bring out the colors of the boards graphic. Made from our high quality, chip-resistant formula, these wheels will ensure your ride is smooth and easy. White powder coated trucks allow the bright colors of your Woodstock graphic board to really shine. The high-quality aluminium construction off penny trucks keeps your ride light, strong, and ready to carve. The 22" Woodstock features blue, white, red and purple high tensile bolts to highlight your graphic colors and complement the blue deck.